Cloudy sky, gloomy weather, muddy roads and the list continues… Are they stopping you from staying stylish this monsoon? Do not worry, because you are on the right website and here are the answers to most of the fashion problems one faces during the monsoon. Footwear : If you are a person who walks a lot, then you must choose the right footwear for the monsoons. So the first tip is do not wear delicate footwear. For example delicate footwear like driving shoes are most likely to get damaged during the monsoons. On contact with water delicate shoes may even lose their shape and lustre. Say no to Flip Flops. Flip flops may end up splashing dirt and water while one is walking on a muddy road and some flip flops might have slippery bottom too, ahh! You know the consequences of a slippery footwear, don’t you? Tip : Wear monsoon friendly rugged shoes or light weight monsoon friendly netted shoes that dry quickly. Avoid Suede and leather shoes. Another small tip is, ask the salesperson that, whether the shoes that you are buying can be worn during monsoon, while buying the shoes. Say No to leather accessories : Wrist watch with leather belt, leather bags etc. Instead go for metal wrist watches and synthetic waterproof bags. Choose dark coloured clothes over light coloured ones : Ever been in a situation where passer by jumped into a puddle or a motorist drove over the puddle, finally resulting in muddy water splashing over you ? If yes, you know the pain. Ummm, so if you wear dark coloured clothes during the monsoon, you can prevent the intensity of this damage to a certain extent. Shorts and Tees for the Casual Dude : This point doesn’t work out for the Formal Dude who’s serious about dress code or for an office goer. However he can go for it (shorts and tees) during the weekends and other casual occasions. Light and Thin Socks : They dry quickly and are a boon during the monsoons. A small polythene cover or bag : In case you are a bike lover or a daily commuter who takes two wheeler to the office, then a polythene cover may come in handy to prevent your electronic gadgets, to come in contact with water. Umbrella : They prevent you from getting drenched and on the other hand they can also be a style statement. Choose an umbrella based on you need. If you are in your sixties with a macho beard, broad chest and shoulders, then you can go for a lengthy and pointed umbrella. If you are an office goer who doesn’t care for an umbrella as a style statement then you can go for the regular umbrellas. However, if the common umbrella stand in your office is filled with same coloured umbrellas, then you can buy a coloured umbrella, just to prevent you from getting confused in distinguishing your umbrella from the rest of the umbrellas in the common umbrella stand, at the end of day’s work. 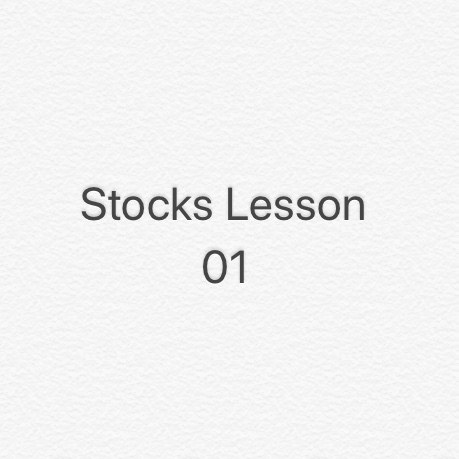 Stocks Lesson 01 is the first lesson in Trading Stocks Series. The motive of this product is to teach ‘How to Trade Stocks ?’ to those who do not know much about stocks. If you are a pro trader this product is not for you, this product is for beginners. Money spent on this product by the customer is not refundable. Before purchasing the product the customer has to contact @preetham_raghu on Instagram via Direct Message. Because only @preetham_raghu knows the PRODUCT KEY that unlocks the product. On successful payment the product key will be delivered. The customer should take screenshot of the product key and keep it safe.